How much of Zurich can you see in an afternoon in late fall? The surprising answer is, a lot! I was in Zurich to catch a flight back to the U.S. and had a few hours to sightsee. 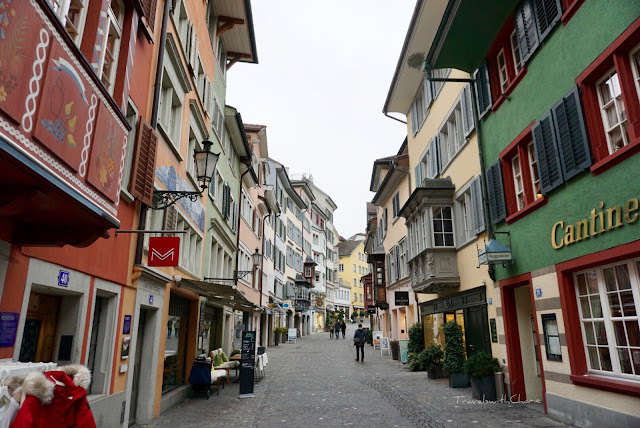 After checking in at the hotel and reviewing the city map the receptionist gave me, I hurried down to Bahnhofstrasse and followed the busy shopping street towards Lake Zurich. My first stop was at Augustinergasse, a cobblestone street with overhanging balconies. It is in the Alstadt or Old Town which is the historical center of the city. Some of the most important landmarks like the Fraumünster, the Grossmünster, Peterkirche and the guild houses are found in the Alstadt. Lonely Planet-What happens to unclaimed baggage?